The Big Step Forward Update - Here's Sam & Andrew at the end of their epic 135mile walk across the Glyndwr Way on Saturday to raise funds for our group. They did amazingly over some rough terrain and covered 23,000ft of ascent in ten days!! The weather was kind to them with only one wet day, which helped enormously. We are in process of gathering all the sponsor money and will give you and update of how much they raised for us when all the monies are in. Sophie Wilson and Co-Chairs Sarah Dix and Clare Jervis receiving £250 from Jack Brumpton on behalf of our group. Jack, along with his Mum Julia, and Julia's work colleagues at NAViGO, who provide the mental health services to NE Lincs, had a fundraising cake and bric a brac charity stall at Diana Princess of Wales Hospital. Many thanks to Jack, Julia and Julia's colleagues at NAViGO for your support. The Grimsby Telegraph have an article about our group in the 13th March 2013 edition. Click here to read. "At 5pm on Monday 4th February, the Children & Families Bill was presented in Parliament. The Bill was published today. Section 3 of this Bill is based on the draft SEN provisions that IPSEA analysed in October 2012. Our Press Release has some initial observations. Edward Timpson, the Minister responsible for SEN, has written a letter explaining some of the changes made to the draft provisions. IPSEA will produce a thorough analysis of the Bill in due course. We will let you know once this is completed." See the IPSEA website for more details. Symbol UK provides specialist speech and language therapy services, consultation and training focusing on children and adults with special needs, communication difficulties and/or eating and drinking needs. The UK All Party Parliamentary Group on Down Syndrome has published a report presenting good practice guidelines for education for children and young people with Down syndrome. The new report, published by the UK All Party Parliamentary Group on Down Syndrome, offers guidelines on education for children and young people with Down syndrome aged from birth to 25 years. The All Party Parliamentary Group on Down Syndrome (APPGDS) aims to to raise awareness of issues affecting people with Down syndrome, and the prospects for improving life outcomes, and to campaign for changes to government policy to improve the lives of people with Down Syndrome. The APPGDS steering group includes family members and representatives of IPSEA, the Down's Heart Group and Down Syndrome Education International. The report was prepared by an Education Working Group, assembled by the APPGDS, including psychologists, speech and language therapists, teachers and representatives of the Down's Syndrome Association, Symbol UK, NASEN, IPSEA, The Education Centre for Children with Down Syndrome and Down Syndrome Education International. The report summarises information about the specific learning needs of children with Down syndrome and sets out principles for effective education practice. The Pelham Singers, of Immingham have kindly donated £300 to our group. Sarah Dix received the cheque on behalf of the group - thank you! 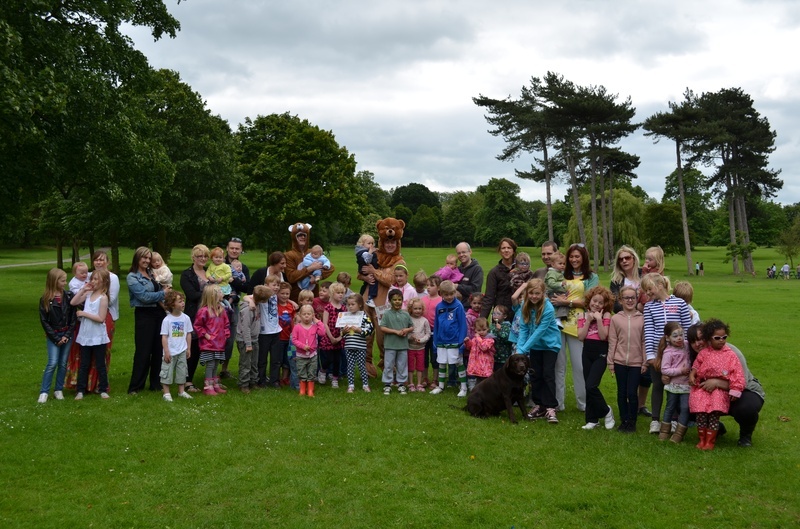 Well done and a huge thank you to everyone involved with the Communication Group sponsored walk held in July. Group member Donna Elliot organised the event to raise funds to buy iPads and specialist Apps for children attending the Communication Group sessions . The total raised so far is £2820.50! Thank you and well done Donna! A full report by Debbie Whiting and more photos are on the Communication Group page and in the Photo Gallery.